They’ve long been a critical component of the business process, but traditional contract agreements are increasingly becoming inadequate. Struck between providers and their clients, contracts are designed to clarify expectations and deliverables before works are performed or goods and services delivered. They nail down the details for each party. Yet, in many situations, they perform miserably. Long-term projects and agreements strike problems and end in failure, and the contract can do nothing to prevent it. The IT services industry in particular is littered with examples of largescale projects that have not delivered. There are doubtless many more that do not get aired in public. No one is saying that contracts are not important: the business world could not function without them. However, their shortcomings need to be recognised and steps taken to ensure they produce results for both parties. One of the key challenges that can’t be sufficiently addressed in a contract is the increasing pace of change in the business world. Economic conditions, the competitive landscape and technology are all evolving at breakneck pace. As a result, it’s virtually impossible to put in place a contract that can cover future change. Contracts are based on assumptions about the future using the past as a yardstick. For this reason, a seemingly rock-solid five-year services contract can end up being almost irrelevant or even counter-productive just months later. Technology can be particularly problematic. Computing technology cycles, which used to last around a decade, are becoming compressed. Desktop computers are increasingly being cast aside in favour of mobile devices while the rise of cloud platforms is causing fundamental shifts in technology infrastructures. Meanwhile the emergence of the Internet of Things (IoT) and big data are causing further waves of change. Opportunities that, until recently, did not even exist are quickly becoming ways in which organisations can gain a competitive advantage. 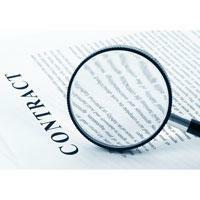 All of this poses big challenges when it comes to formulating a contract. How can the parties involved reconcile the need for an agreement that clearly delineates responsibilities with an awareness that those very responsibilities may suddenly and surprisingly become outdated? The answer is to go beyond the contract. Rather than replying only in sterile language and service level agreements, successful agreements should also take into account factors such as transparency, flexibility and mutual respect. Taking this route means that the written contract therefore provides the legal basis for a relationship that goes well beyond that contract. Added flexibility on the part of both parties means that any unforeseen changes that occur can be addressed. It should be noted, however, that this more flexible approach doesn’t simply mean that the service provider will end up doing more work more quickly or more cheaply than was agreed in writing. Rather, it means that both involved parties respect and understand the value of a lasting relationship. Both strive to ensure that the terms of the contract are not just met but that sustainable value is also created. In practical terms, such an approach might involve agreeing, mid-engagement, to a new set of deliverables in order to achieve the original result. Alternatively, compensation could be made contingent on the delivery of specific business benefits. Perhaps a plan might be recommended that benefits the client, though reduces revenue for the provider or even makes their current services redundant. This could be termed proactive obsolescence. Naturally, such a ‘beyond the contract’ relationship is only likely to succeed if the company culture of both parties embodies the same ideals of trust, transparency, flexibility, and value creation. Yet finding such a match is vital, if organisations are to find a way to navigate a rapidly changing technology landscape. Once service providers are no longer constrained within the boundaries of written contracts, interesting things can occur. Rather than being focused on delivering against a pre-determined list of criteria, every employee is empowered with the ‘licence to ideate’ for their customers via a belief in the values of trust and transparency, employees first and value-centricity. Ideapreneurship* recognises the untapped potential value of each employee irrespective of their designation, location or seniority and encourages them to participate in everyday innovation. It simultaneously allows our organisation to empower employees and give customers access to a huge pool of innovations. At HCL, ideapreneurship has created an atmosphere where employees are taking the lead to find solutions and ideas and then leading them to fruition. Ideapreneurship puts employees at the forefront of innovation where they innovate and collaborate with each other and with customers to seed, nurture and harvest ideas. This innovation and collaboration culture has given rise to a number of key enablers and tools to bring about a business impact, such as the Value Portal. The Value Portal is the first of its kind among IT service providers, a unique grassroots innovation platform that encourages, facilitates, manages, records, and shares customer-focused innovations at HCL through which employees can post ideas and have them reviewed and approved by senior managers. To date, more than 32,000 innovative ideas have been generated for 380+ customers, with $631 million value delivered. The Value Portal is a real example of ideapreneurship at work. It is the culture of ideapreneurship which helps us take the relationships beyond the contract. Through innovations such as this, companies can ensure they are best placed to succeed in a constantly changing business and technology landscape. Michael Horton is HCL’s Senior Vice President & Country Manager for Australia and New Zealand and the Rest of World (RoW) Natural Resources Lead for Mining, Oil & Gas. He holds a Master in IT Management and an Associate Diploma in Applied Science and has more than 30 years of experience in global IT sales and delivery, many of those in a senior leadership role. Michael Horton has written 1 articles for us.